A minstrel, called by King Charles VII, will meet one of the greatest captains that France has ever seen during the Hundred Years War, and he will bring back to memory his history since the beginning. The firsts meaningful memories of Etienne de Vignolles, start when he tastes the thrill of killing a man. What happened before, is only foreignness to a homeland without incitements and lots of downed trees! He's a giant of six and a half feet in height and he's only 18 years old. Under an angry gaze is hiding a hot-blooded Gascon illiterate and a bit childish, but very brave and generous, although sometimes unscrupulous. He will soon discover that beyond his native land, there is a world for his need, a world of pure adrenaline, deathmatches and legendary feats. Charles VI was only 11 when he inherited the throne in the midst of the Hundred Years' War. The government was entrusted under the regency of the four dukes: Philip the Bold of Burgundy; John of Berry; Louis I of Anjou; and Louis I the Great of Orleans, who maintained their grip on Charles until he took power at the age of 21. During the rule of his uncles, the financial resources of the kingdom, painstakingly built up by his father Charles V, were squandered for the personal profit of the dukes, whose interests were frequently divergent or even opposing. As royal funds drained, new taxes had to be raised, which caused several revolts. In 1388 Charles VI dismissed his uncles and brought back to power his father's former advisers, known as the Marmousets. Political and economic conditions in the kingdom improved significantly, and Charles earned the epithet "the Beloved". But in August 1392 en route to Brittany with his army in the forest of Le Mans, Charles suddenly went mad and slew four knights. From then on, Charles' bouts of insanity became more frequent and of longer duration. However, unable to concentrate or make decisions, political power was taken away from him by Louis of Orleans, the king's brother, and John the Fearless, Duke of Burgundy, the son of Philip the Bold. When John instigated the murder of Louis in November 1407, the conflict degenerated into a civil war between the Armagnacs (supporters of the House of Valois) and the Burgundians. -Story based on extensive documentation. -Main quests and Side quests. -Final score to note for next chapter. -Before playing the game, please read the file: JOH_c1 Readme.txt and follow the instructions. -Please report any problems/bugs in the official topic. -For game's suggestions, ask in the official topic. How do you make the intro? It like a ES intro. Btw this scenario is very nice. Hi, I have non-hd forgotten empires mod so is this user path benefitial this. Are you meaning if you install the userpatch 1.4 on your FE mod, the game will run without problems? I don't know... You should Install the patch on the original version of AoE2 The Conqueror and surely you won't have any problems! This is really a long project! But I hope that players will give a boost to me to go on! Jack of Hearts: An Untold Story is the introduction to the adventures of Etienne de Vignolles, a.k.a. "La Hire", one of the French Military commanders during the Hundred Years War. Set in the Gascon countryside surrounding Prechacq-les-Bains, we follow the boy Etienne as he attempts to realise his aspiration of fighting for France. Jack of Hearts leaves me with the same awe that I felt while playing the first file I downloaded from the Blacksmith. That file was "Brelda the Hun, Chapter I", and the similarities do not end with the name. In both Role-playing scenarios, we take command of just a single unit, as we set out in a forested area to do small quests while the player follows a grand quest that will take him around the world. While the adventures of a young Hun were never concluded, King Leorick is already working on the second chapter of Jack of Hearts. There are, however, some blemishes on the shine. Jack of Hearts is not the same refined experience that one enjoys with S_M_T's Brelda. While we take command of a single villager, the player is often required to fight multiple soldiers at once. In order to defeat enemies, one must use the taunt powerup, which is not simple to use. Many fights turn into a matter of luring enemies one by one, killing them, running away to heal, and returning to fight the next enemy. There are about a dozen sidequests which the player must complete in order to acquire gold. However, all the friendly NPCs are the same colour. This means that finding the quests is a chore, when a simple colour change could have made things much easier for the player. The quests themselves give a great deal of variety of the gameplay, but some can be frustratingly difficult due to a lack of direction. The pace of the game slows down as it goes on, as the player must travel back and forth across a relatively small map in order to progress. Often the scenario seems to punish the player for actions outside their control: for example, in the opening action Etienne's brother attracts the attention of an enemy militia, and lures him about in a way that makes it difficult to save him. Later on, beggars will attack you if you refuse to give them your hard-earned gold, and will poison you in a way that is impossible to heal. Garrisoning inside buildings can occasionally end the game, since the Church's watch tower traps the player when you ungarrison. 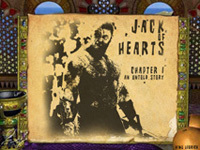 As one final point of criticism, the title sequence misspells the game name as "Jack of Heart". Jack of Hearts is, at times, frustrating. The level of difficulty is unflinchingly high, the player is not given any help by allies in fighting enemies. There are some tasks which have unintuitive solutions, and others make the game more difficult for the player than is reasonable: for example one is tasked with building a mill in a short time, and the player's villager is tasked to stop building repeatedly. Nevertheless, the difficulty makes the gameplay challenging and all of the tasks are possible. It is here that Jack of Hearts shines. To catalogue the many moments where Jack of Hearts caught me by surprise would spoil some of the sense of awe that the player will enjoy. It should be suffice to say that Jack of Hearts is a triumph of craft and execution, with King Leorick demonstrating a high level of skill with the editor. It uses and abuses trigger tricks that are well known and loved, and innovates to make good on all the aspects of gameplay. The map, triggers, taunt system and story are all exemplary demonstrations of King Leorick's creativity. While in general the map is to a high standard, there is a certain roughness that I found myself troubled by. In places, blocks of terrain have been used, such as wide dirt 1 roads, which could perhaps have been improved. At other times, trees have been conspicuously rotated to the same graphic for effect. The map uses elevation to alter the difficulty of combat, and climbing to high ground is vital to ensure your survival. The Village itself is a joy to behold, with farms and vineyards that have charming character. One disadvantage of having a villager as the main character is that a determined player can cut through the trees and explore parts of the map that they are supposed to navigate in other ways. Unfortunately, Jack of Hearts is let down by its instructions. While a great deal of effort has been made by King Leoric to explain the mechanics to the player, I was left confused at times and often unable to progress. Frequently I had to experiment in order to complete quests. The shop system did not seem to function properly: I did not know where to look to sell my items. I felt a little overloaded by the amount of information King Leorick was providing me with. I sense that King Leorick is not a native English speaker: some of the lines of dialogue are badly translated and one farmer's son even speaks to me in Italian, after I kill a wild boar that has rampaged around his field! Despite the occasional clunkiness, the story is deep and engaging. It would otherwise be a strong point, as there are many characters which have strong and unique personality, to provide the player with a sense of immersion into Etienne's world. I look forward to the next installment for the continuation of the story. A diamond in the rough, Jack of Hearts has plenty of room for improvement, but King Leorick's talent for scenario design is obvious, and I think that once complete, the Jack of Hearts series will be remembered as a masterpiece. Well, is not so bad for a rookie! Thank you Popeychops for the review! This is my first work, and I'm happy to receive so high rates! The same thing was for playtesters... I was afraid to upload an untested game, but the regret to wait more time was too big! My style, as you've seen, is very realistic, often too much, but I like that a player have to think about what he's doing. In a realistic situation, you can't have a boy who hits trees for all his day, that becomes instantly a flawless killer who defeat everyone in every challenge. I remember when I played at Diablo I for the first time using the sorcerer: I was dying every 5 minutes! At the beginning everything is difficult, so I put my game in a real context. This review helps me to fix lots of things, thanks to the reviewer!